TASS Movidius uses pretrained Inception V3 & Yolo models and an Intel® Movidius to carry out object and facial classification, both locally and on a live webcam stream. TASS Movidius uses the IoT JumpWay for IoT communication and publishes messages to the broker when an object is identified. IoT connected computer vision device using a Raspberry Pi 3 & Intel® Movidius. The first thing you will need to do once you have your operating system on your device is to install the NCSDK. Make sure you have Raspian Stretch installed as the operating system on your Raspberry Pi 3, install Tensorflow 1.3.1, then continue with the normal install. You will need at least a 16gb SD card on your Raspberry Pi 3. When using the Raspberry Pi 3 you can choose to only install the API. This will mean that the core features of the NCSDK will not be installed on your Raspberry Pi 3. If you choose this option you will need to set up another device with the full installation, convert your model on that device and upload/download the files to the Raspberry Pi 3 manually. If you follow this step you should move to Getting Started With The IoT JumpWay once this step is completed. There are a few tutorials that you should follow before beginning, especially if it is the first time you have used the IoT JumpWay Developer Program. If you do not already have one, you will require an IoT JumpWay Developer Program developer account, and some basics to be set up before you can start creating your IoT devices. Visit the following IoT JumpWay Developer Program Docs (5-10 minute read/setup) and check out the guides that take you through registration and setting up your Location Space, Zones, Devices and Applications (About 5 minutes read). Setup an IoT JumpWay Location Device for TASS, ensuring you set up you camera node,as you will need the ID of the camera for the project to work. Once your create your device, make sure you note the MQTT username and password, the device ID and device name exactly, you will also need the zone and location ID. You will need to edit your device and add the rules that will allow it to communicate autonomously with the other devices and applications on the network, but for now, these are the only steps that need doing at this point. Follow the IoT JumpWay Developer Program (BETA) Location Device Doc to set up your devices. Download the TensorFlow checkpoint file. 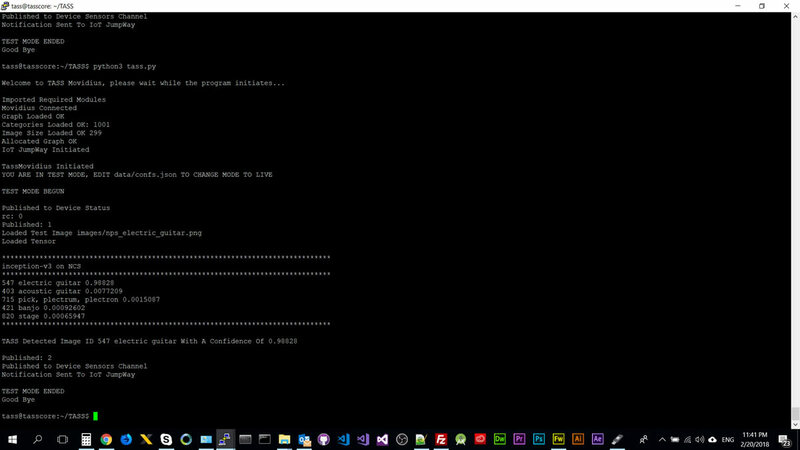 Run the conversion/save python script to generate network.meta file. 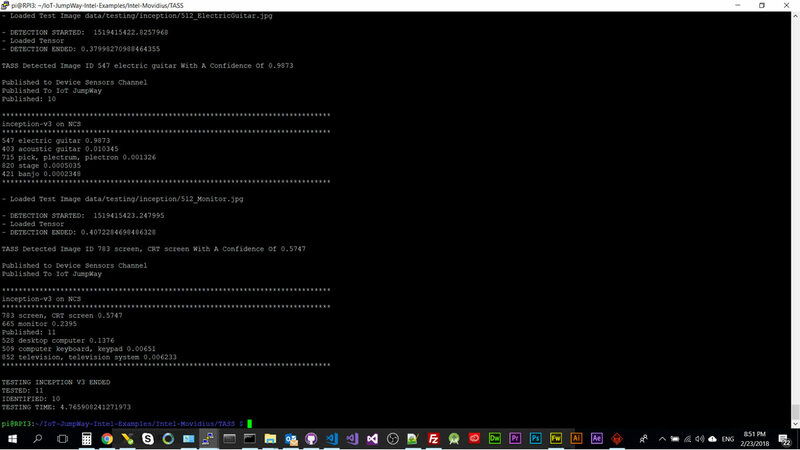 Profile, Compile and Check the network using the Neural Compute SDK. Once you have done this you should see a file called graph, for this tutorial to work you need to rename this file on your device to igraph. This will allow you to switch between the Inception V3 model and the Yolo model without having to recompile the graph every time. This tutorial provides a number of configuration modes. For ease, all of the classes and functions that allow the different modes to work have been provided in tass.py and yolo.py. You are free to create your own projects and modules from these codes. Now that everything is working, you can execute the following command which will start the program in Inception V3 object detection testing mode. To be in test mode you must edit the ClassifierSettings->MODE setting in data/confs.json to be InceptionTest. You can add new images to the testing folder by adding images to data/testing/inception. Using a Raspberry Pi, it should of taken about 0.3 / 0.4 seconds to classify each image. Out of the 11 images tested 10 were identified with a confidence higher than 50%, the whole process should take around 4-5 seconds on a Raspberry Pi. TESTING TIME includes the time it took to process the 11 images, classify them, and send a notification to the IoT JumpWay for each object identified. Using a Raspberry Pi, it should of taken about 0.3 seconds to classify each image. Out of the 11 images tested 10 were identified with a confidence higher than 50%, the whole process should take around 4 or 5 seconds on a Raspberry Pi. TESTING TIME includes the time it took to process the 11 images, classify them, and send a notification to the IoT JumpWay for each object identified. 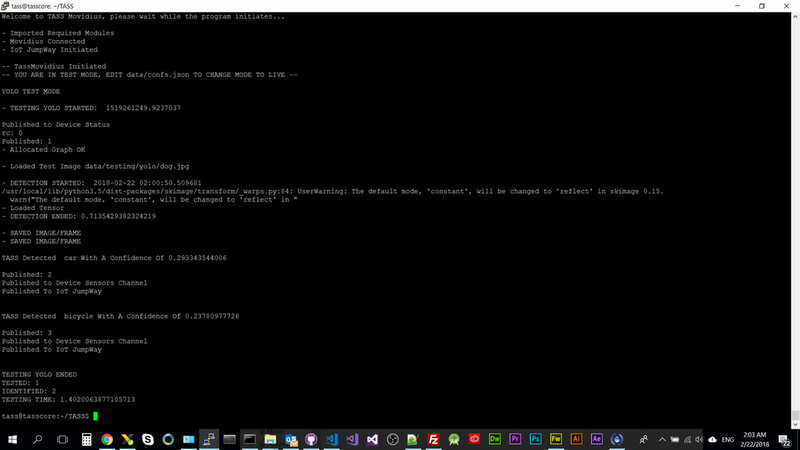 You can execute the following command which will start the program in Yolo object detection testing mode. To be in Yolo object detection testing mode you must edit the ClassifierSettings->MODE setting in data/confs.json to be YoloTest. You can add new images to the testing folder by adding images to data/testing/yolo. Using a Raspberry Pi, it should of taken about 0.7 seconds to identify the car and the bicycle, it does not however identify the dog. TESTING TIME includes the time it took to process the image, classify it, and send a notification to the IoT JumpWay for each object identified. Using a Intel® NUC, it should of taken about 0.7 seconds to identify the car and the bicycle, it does not however identify the dog. TESTING TIME includes the time it took to process the image, classify it, and send a notification to the IoT JumpWay for each object identified. 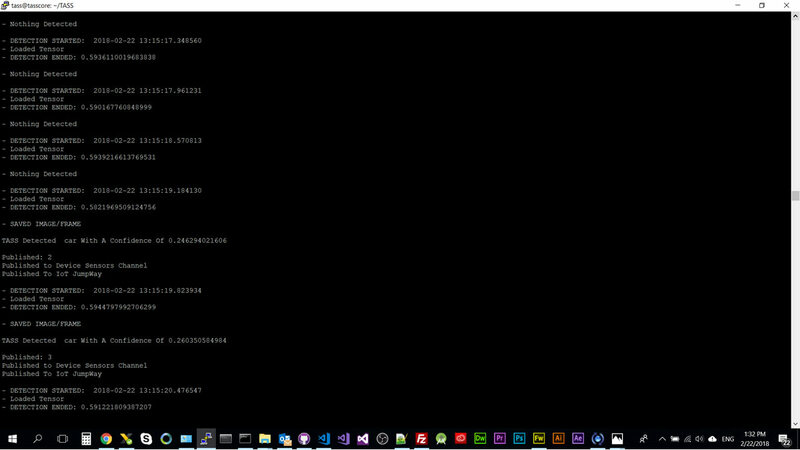 First of all make sure your camera is connected and update data/confs.json with your sensor information from the IoT JumpWay. You can also point to live stream on an IP cam using the URL field below, leaving it as 0 will connect to the webcam attached to your device. 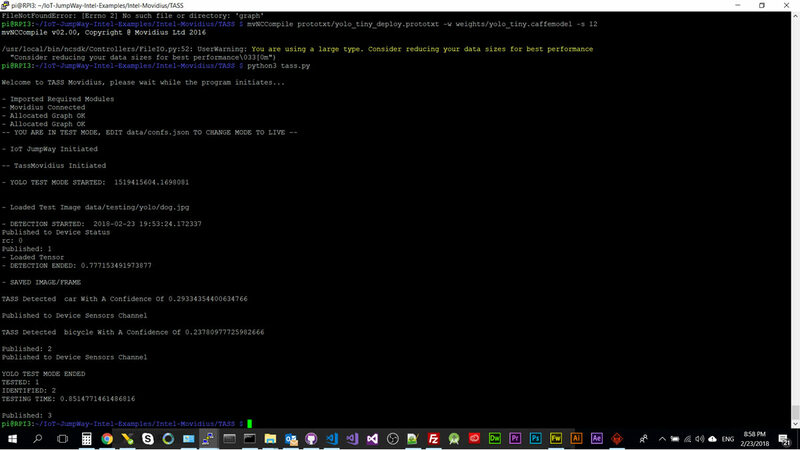 You can execute the following command which will start the program in Yolo object detection live mode. To be in Yolo object detection live mode you must edit the ClassifierSettings->MODE setting in data/confs.json to be YoloLive. 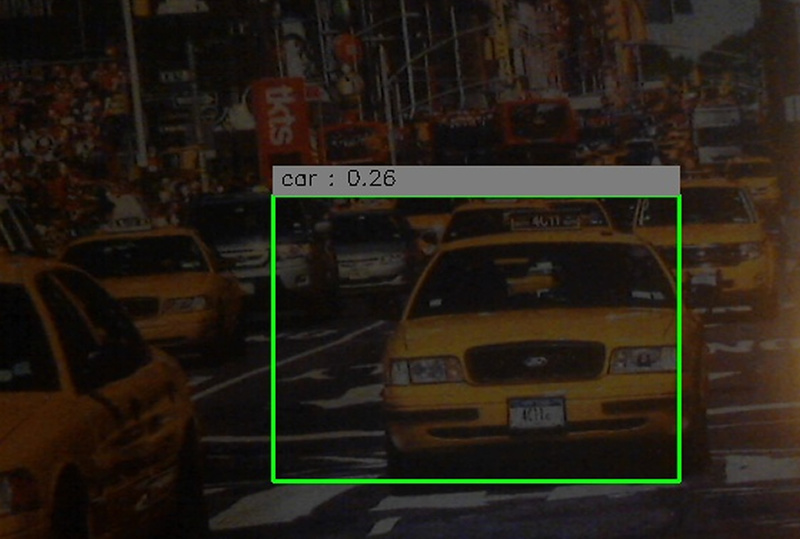 Using a picture with New York Taxis on it, TASS was able to detect a taxi taking about 0.6 seconds to classify the taxi. 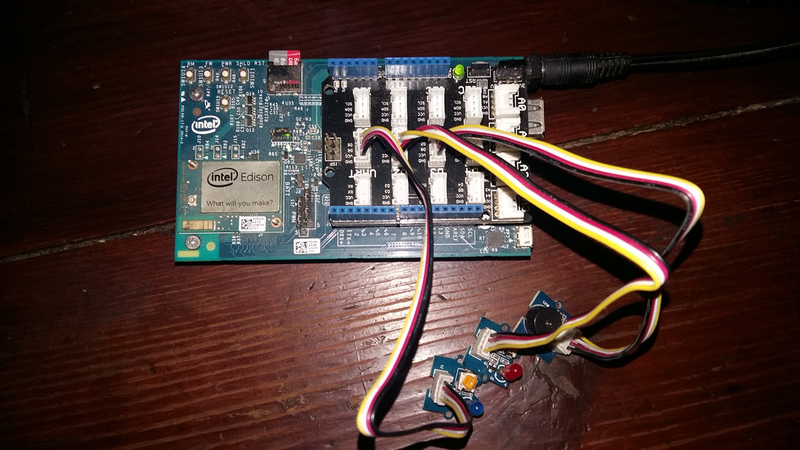 The next step is to set up your Intel® Edison so that TASS can communicate with it via the IoT JumpWay. For this, I already created a tutorial for the IoT JumpWay Intel® Edison Dev Kit IoT Alarm that will guide you through this process. The only difference is that you do not need to set up the Python commands application, as in this project, TASS will replace the Python commands application, to save time, please only follow the steps for the Intel® Edison device Node JS application. Once you have completed that tutorial and have your device setup, return here to complete the final integration steps. You are now ready to take the final steps, at this point you should have everything set up and your Intel® Edison Dev Kit IoT Alarm should be running and connected to the IoT JumpWay waiting for instructions. Next we are going to set up the rules that allow TASS PVL to control your Intel® Edison Dev Kit IoT Alarm autonomously. Go back to the TAS PVL device page and make sure you are on the edit page. Scroll down to below where you added the camera node and you will see you are able to add rules. When an object is identified, turn on the red LED. When an object is identified, turn on the buzzer. The events are going be triggered by warning messages sent from TASS, so in the On Event Of drop down, select WARNING. Then you need to select the camera node you added to the TASS device, as this is the sensor that the warning will come from. Next choose RECOGNISED in the With Warning Of, which will mean that the rule will be triggered when the IoT JumpWay receives a warning message that an object has been identified, then select the Send Device Command for the Take The Following Action section, choose the Intel® Edison as the device, the red LED as the sensor, toggle as the action and on as the command. This will then tell the Edison to turn on the red light in the event of an object being detected, repeat this process for the buzzer. In the event that an object is detected with a confidence higher than the threshold, the frame will be saved in the data/captures folder, bounding boxes will be drawn around all objects that are detected. When the program detects an object, it will send sensor data to the IoT JumpWay. You will be able to access the data in the IoT JumpWay Developers Area. Once you have logged into the Developers Area, visit the IoT JumpWay Location Devices Page, find your device and then visit the Sensor Data pages to view the data sent from the device. 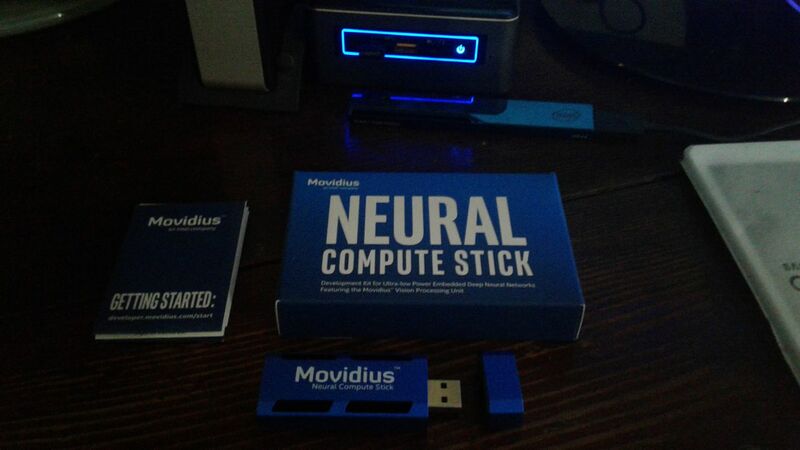 TASS Movidius uses pretrained models and an Intel® Movidius to carry out object and facial classification.